My interest in Warhammer 40k has been greatly revitalized this year with the release of the 8th edition of the game, which greatly streamlined the rules. With the much lower barrier to entry and release of an all new Death Guard line of Chaos Space Marine models, 40k has been monopolizing my hobby time for months now. The Death Guard are Heretic Adeptus Astartes that have pledged themselves to the Chaos god Nurgle, god of death and decay. They are 1oo% my jam, with loads of opportunities for gross gribbly bits and, most importantly, filthy, dirty, rusty armor. I wanted to add some armored support to my fledgling army before the full Codex came out, which meant Chaos Predators. I am basing my army on the 2nd Plague Company of the Death Guard, hosts of the Ferric Blight. I am modeling them as a well-equipped Vectorum, with lots of relic armor and equipment that has decayed over the millenia, but not mutated as much as other Death Guard armies. I wanted to use old style Predator tanks that have survived since the Heresy, but I was not married to the Deimos Predator kit from Forge World’s design, or to the idea of paying for those. Instead, I decided to make my own as a bit of a challenge, to see if I could come up with nice gaming-quality models for 3D printing that would not look out of place on the table alongside official models. I had previously printed some Rhinos from files I downloaded on Thingiverse, which I used as the starting point for my own Rhino-based vehicles. I mostly was trying to avoid having to model the tank treads, so the existing files were a great starting point. From there, I decided to blend the details of the Forge World Deimos kit for the turret and front armor with the original Predator Tank kit from Games Workshop for the armored side sponsons. For a clunky, millenia-maintained tank, I added some stovepipe exhaust stacks to the sides. In the first image above, the grey sides of the tank are the existing files I borrowed from Thingiverse, and everything in black was drafted by me from scratch. The rest of the pics above show the progress of the tanks, from bare plastic to acetoned and primed, then base colored with an airbrush, and finally detailed and weathered for maximum grunginess. Lots more pics after the cut walking through the painting process. Finecast is the newest ‘big thing’ from Games Workshop. In essence, they are replacing their metal minis with a custom mix resin. The new material holds very sharp detail, is springy for durability, and cleans up really easily. Advantages aside, it is actually more expensive than the metal figures, which is absurd. Forge World is the limited model garage-company branch of Games Workshop, and makes high-quality resin models for the mode dedicated modelers among the GW masses. The Vulcan Mecahrius is a super-heavy tank used for breakthroughs and heavy support. I was really inspired by ImpterialArmor:Masterclass, a modeling book released by the Forge World artists, and tried out a few things I picked up from that tome, including more oil work, and more layering. I’m really happy with the results, and think it’s my best armor model so far, and am interested to see what people think… this is around the standard I want my SM tanks to look at the end if the day, and I’ve got a detailed Rhino awaiting exterior paint, so we’ll see how these ideas hold up. I converted the commander to have one hand on the stubber and the other pointing, as I’ve got a DK flamer team to go with this model, and I may end up doing a diorama base for the two models. I also got some good use out of my GW spray gun early on… the base color green is custom mixed, and was sprayed to save alot of time and preserve the surface detail. What might surprise some is that the camo color was sprayed on as well… obviously you can’t do very fine squiggly camos with the SG, but for a nice broad banded camo, it worked to great effect. From there I some detail work and started the weathering, including acrylic work for shipping, oils for surface discoloration, dirt, grime, rust, oil, and fuel staining, and pigments and acrylics for the mud and dirt and the tracks. 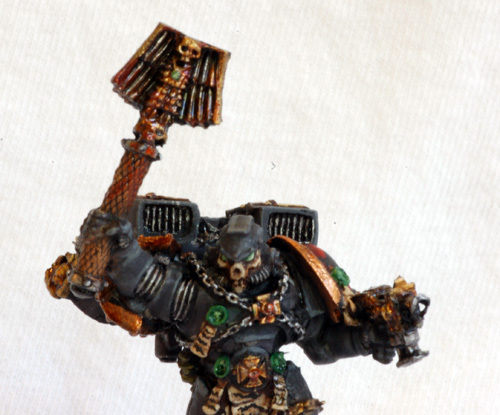 This is really one of GW‘s best models ever… he’s big, mean, imposing, and incredibly detailed. Alot of fun to paint… This guy is my warm-up figure after being out of mini painting for a year or two in lieu of historical and sci-fi models. I used Andrea Color’s black paint set for the armor, with a mix of Valeijo colors and mediums, and GW and P3 paints. He’s got alot more blending than I’m used to, and it shows in the closeup photos and harsh lighting, but this is all I’ve got here at college. The weathering was done with MIG Production dry pigments on the base and model. This is a squad of Blood Angels Assault Marines I finished not too long ago for my Warhammer 40k army. For those of you that might not know much about Warhammer 40k, Space Marines are genetically engineered super soldiers, and the Blood Angels are some of the fiercest fighters among them. I try to aim for a more realistic battle-hardened look to my minis, and these guys were the first group to receive some new ideas I’d gotten from my work on larger scale models. These are plastic models, except for the Sergeant, who is metal, and all of them have some GreenStuff putty details added, mostly from press-molds of details I made from other models.